"The Great Philly Cheesesteak Book," new from Running Press, is by Carolyn Wyman, author of "Spam: A Biography." Fascinated by cheesesteaks, all the lore and more? 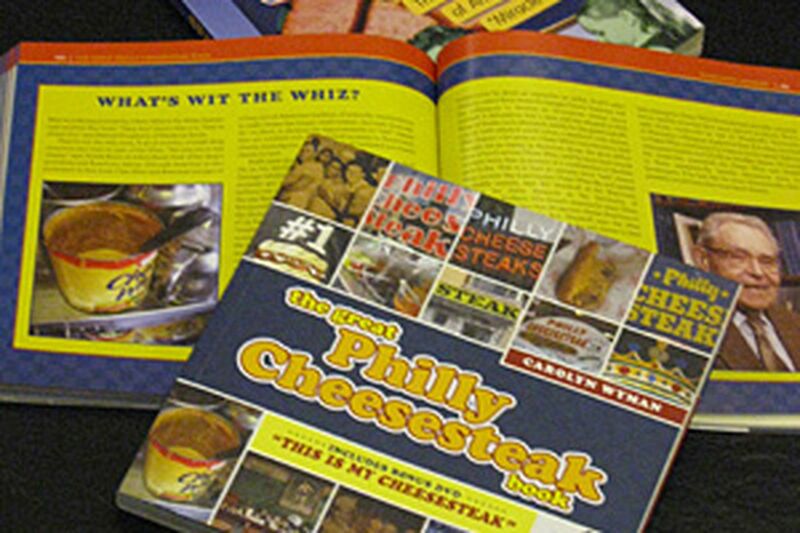 Then check out The Great Philly Cheesesteak Book, new from Philadelphia's Running Press. A better best hoagies list? Want to know who serves what meat on which rolls? She tells you for 38 major steak shops, from Pat's and Geno's to Claymont Steak Shop in Delaware - and shares stories about the folks behind the food. Want a fix while out of town? Consult the "Shore Tour," or a list of cheesesteak places around the country, or the rundown of who'll ship cheesesteaks - at tough-to-digest prices. The book even includes a DVD of the "only" cheesesteak documentary, This Is My Cheesesteak, by a former vegetarian who made one yearly exception: "to have one real cheesesteak - after which I got sick." Surprisingly, there was a book on Scrapple, but not one about cheesesteaks, said Wyman, 53, who will lead a bike ride tomorrow to eight city steak shops. 1. Even when Tony Lucidiono Jr., owner of Tony Luke's, weighed 325, his cholesterol didn't top 165. He credits cheesesteaks. 2. "The most successful national Philly cheesesteak chains were born in Ohio." 3. Geno's monthly electric bill is $5,000. 4. Le Bec-Fin's renowned Georges Perrier declared Chink's best during a WIP-AM cheesesteak showdown. 5. A maker of cheesesteak hats might extend the theme to air fresheners (sandwich-scented or -shaped? ), finger puppets and antenna toppers. 6. In December 1998, the Eagles set the world record for longest sandwich by creating a cheesesteak on a single roll as long as a football field, counting end zones. 7. Steak-umm, the most successful boxed frozen sandwich steak, got its name during an argument over what to call it. Fed up, someone used a profanity followed by ". . . 'em, stick 'em with Steak-umm." 8. The chicken steak was likely invented in the early 1980s by Bill "Schultzy" Schultz of Billy Bob's in West Philly. 9. The food-service grade Cheez Whiz used by restaurants has more real cheese than the jarred stuff sold at supermarkets. 10. The Philly cheesesteak flavor of Hamburger Helper has french-fried onion topping for "textural contrast." 12. Custom-made Italian pouch rolls make the cheesesteaks at Grilladelphia (at Exxon Tiger Mart on Aramingo Avenue) popular with truckers who don't want grease dripping as they drive. 13. To order a cheesesteak in Russian, say "Mne pozhaluista buterbrod so steikom, s lukom i syrom." 14. The main reason steak rolls are better here is simple: freshness. Other cities don't have the volume to get daily deliveries, Wyman says. 15. To counter rumors of using horsemeat, Pat Olivieri, inventor of the steak sandwich in 1930 and founder of Pat's, once offered $10,000 to anyone who could prove the charge. 16. A "Philly taco" is a Jim's cheesesteak rolled up in a slice of pizza from Lorenzo and Sons. 17. "In order to be cut to the traditional paper-thinness, the meat must be at least somewhat frozen." 18. The $100 Kobe Cheesesteak at Barclay Prime switched to adding sauteed lobster after animal-rights activists objected to the foie gras. Price includes champagne. 19. A Milano-style pizza steak has grilled fresh tomatoes and spices instead of pizza or marinara sauce. Philip's on Passayunk, for one, has it. 20. Silvio's in Hatboro uses Cooper cheese - not American, provolone or Whiz - along with thin-sliced top round and Bermuda onions on its cheesesteaks. 21. Even potato chips have been made to taste like cheesesteaks (Herr's, 2006). 22. "Fake steaks" - vegetarian cheesesteaks - are sold at such places as the Abbaye, Sabrina's Cafe, Gianna's Grille, and even Campo's at Citizens Bank Park. 23. T-shirts at Sonny's in Old City read "Bite Me" above a drawing of a sandwich. 24. Cheesesteak Salad is made with chopped onion and sandwich steak, grilled in a skillet then topped with sliced provolone and served on a bed of romaine lettuce. Cherry Pepper Dressing optional. 25. Bob Dylan once offered an autograph at Jim's on South Street, but got turned down by an unimpressed meat cutter. Wyman - who with her husband freely chose to move to Philly about seven years ago, partly for the food - said the book was a labor of love. With most products, you run into lots of "corporate speak," she said. "It's real people with their own ideas about things," she said. That's what made the subject "refreshing and great."